The Fisher Isotemp Water Bath 110 provides digital temperature control and is ideal for industrial, clinical, pharmaceutical or biomedical procedures. The temperature range of this Isotemp waterbath is ambient to 100°C and features a gabled stainless lid that not only helps retain heat, but also channels condensation away from dripping back onto samples. This 10L water bath has a low profile analog control for easy access and a dual thermostat to guard against thermal runaway. The Isotemp 110 bath has excellent control with a uniformity of ±0.24°C, an accuracy of ±0.5°C and stability at 37°C. Additionally this laboratory water bath is built to last, with a corrosion resistant, acrylic enamel exterior, and a deep drawn, single piece rounded corner, stainless reservoir with removable trays for easy cleaning. 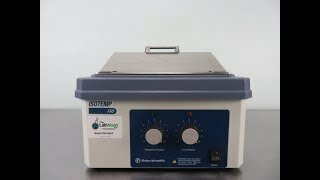 The Fisher Isotemp 110 Water Bath is in excellent condition reaches temperatures without issue. All of our lab equipment comes backed with our standard warranty. Should you have any questions, please don't hesitate to contact us.